This was posted on February 4, 2014 by Sarah Maxwell. I know there are some who are interested in a baby update. Anna Marie is at 38 weeks. Since she was two weeks late with Joshua, it’s possible this will be a March baby. Whatever the timing, Anna Marie is perfectly content waiting. The baby has been active, and we’re looking forward to meeting him/her. Christopher and Anna Marie are grateful for your prayers as they continue in the parenting journey. We can’t wait to share the news when the baby is born. I too am 38 weeks…My due date is Feb. 17th. Our youngest is 9, so you can imagine how excited that we all are. Well, and I’m a little nervous about the labor thing. It’s been awhile and it will be a VBAC for us. Praying for her and her sweet babe. Please let us know how you are doing after baby arrives. Thank you for keeping us posted. I’m praying that God will continue to sustain Anna Marie and fill her with peace and strength as these weeks progress. Thanks for the update! We are excited for Anna Marie and Christopher and Joshua and all of your family. Prayers being sent from here to your family for an uncomplicated delivery and healthy little one. Can’t wait for photos! Praying for mother and child, God is so good. Blessing to the whole family. Thank you for the update. Anna Marie is a beautiful expectant momma. I’ll definitely be lifting them in prayer over the next month. Yeah, number 8! Let us know please. Thank you for the Baby update! I´m planning for a homebirth. Psalm 33:20-22 Our soul waits for the LORD; He is our help and our shield. 21 For our heart shall rejoice in Him, Because we have trusted in His holy name. 22 Let Your mercy, O LORD, be upon us, Just as we hope in You. Let us rejoice in our mighty God who formed the babys in the secrecy of the womb! Please let us know about your baby. I am so happy to hear that everything is going well! We pray for a safe and easy delivery. Thank you so much for the update. God Bless. Our eighth baby was due on Feb.17th, but he was born last Monday. We received a healthy baby boy, Noah James, out of the hands of the Lord. 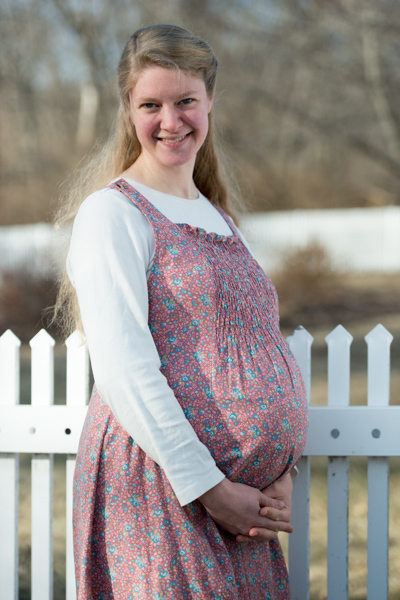 We pray that all may go well in the last part of Anna Marie’s pregnancy and the arrival of the new baby! So happy for you. Thank you for letting us know. Praise Him for this news! Such a wonderful picture of expectancy! Anna, you are a truly pretty lady, and your countenance absolutely glows. Much love and prayers for a healthy delivery from me and my two children. I am excited to see if it is a girl or a boy! Thanks for the up-date! Looking forward to hearing when baby arrives! May your delivery be safe, quick, and as pain free as possible! Praying for Anna Marie and the baby. She always has a pretty smile on her face. Thank you for the baby update, Sarah! We are excited to see their family grow! Anna Marie is the picture of peace and contentment. We will pray for her labor and delivery and for great joy as your family welcomes the new little Maxwell! Christopher and Anna Marie! God bless.